Jacky packed in all the highlights of Hong Kong while giving us just the right amount of history. He seemed to know just what we wanted and paced our tour perfectly. He was upfront when we asked about shopping (no, don't buy that, don't go there, tomorrow go here, etc) In our time together we traveled by ferry, trolly, taxi, bus, train, and about 15,000 steps. His personality, knowledge, and energy made today absolutely fabulous. Tour by Locals was the best choice, second only to Jacky. Many thanks. Thanks a lot Jacky for the great tour, everything was really excellent, we had a brilliant time! Jacky made our short stop in Hong Kong worth it. We landed with 4 small children and he tailored an awesome evening walking tour through the local and tourist markets hitting savoring and sweet snacks along the way. Great source of information with the right humor, Jacky was a pleasure to talk to. He was so accommodating with our last minute request and also highlighted a map for things we should try to see the next day. The entire group of 8 was so happy and we couldn't be more grateful. Thank you Jacky! Jacky is a great guide and the Lantau tour was wonderful. He modified it to include places we wanted to see, and made sure that it was within our physical limits. Tai O is an unmissable place to visit. Jacky was GREAT, a wealth of knowledge on history, culture, facts, everything! He's a great driver on those windy and crowded streets, and found great parking every time! Absolutely felt that our group of six had a marvelous experience in Hong Kong because of his expertise. He's flexible and made the most out of a rainy day...was prepared with umbrellas and bottled water and even bought us a snack of popular pastries from the local market! Definitely recommend! Jackie took us on a tour which had us on the ferry, subway, bus and streetcar. We saw how people lived in Singapore up close and saw many interesting sights. We covered a lot of ground in a short period of time. I would recommend Jacky and would use him again. Would have been higher if he were not on his cell phone doing other business. Did have good walking to local hot spots with good street food sampling. Jacky couldn't have been a better guide - perfect in every way. We toured with Jacky for two different have day tours. We learned a lot about the history and customs of Hong Kong as well as saw the important sites. Very knowledgeable and easy to be with. Thanks Jacky for a great two days! This tour was great for my family of four. Very personal and Jacky was flexible to keep it interesting and fun for my 9 and 12 year old daughters. Jacky was great. 2 of us + him for a fun walk thru Kowloon. He showed us street food and stores we would never have found on our own, with expert stories on food, architecture, the markets, growing up in HK, history, etc. We took some backroads to a random parking lot for spectacular pictures across the bay. Jacky is funny, personable, and incredibly informative. The time went by in a flash. I can't imagine going to HK and missing this. Can't recommend highly enough, worth every cent. Thanks, Jacky! Jacky provided a very personalised tour of Hong Kong for us, with a real 'insider's' perspective. He gave historical and cultural context to the sites we saw with him, plus he provided 2 outstanding recommendations for very 'out of the way'local restaurants. Highly recommended. TOUR GUIDE RESPONSE: Thank you Doug, it was a great day our with all of you. Thank you so much and look forward seeing you again soon. Jacky had lots of history and cultural information at his fingertips--and his great personality and sense of humor made the entire tour enjoyable. His ability to drive (in incredible traffic) made getting around a busy and complex city very easy. Highly recommended! Jacky was an excellent guide. He was very accommodating to our needs as a group of six. We visited some popular tourist attractions along with some very local off the beaten path areas. We had one day in port with him but were returning at the end of our trip to spend an additional coupled of days in Hong Kong. He took the time to explained the MTR system, and helped us purchase Octopus cards for our return stay. He took us to a very local Dim Sum restaurant and thankfully order for us. Great guide! I couldn't have asked for a better birthday present for my brother than the personalised tour which Jacky gave him. He had a great time sampling the food and appreciated both the introduction to HK and all the tips given. Thanks Jacky! Visiting Hong Kong for the first time we booked a 6 hour tour with Jacky. He was great showing us around HK and giving us a lot of information. He even took us to have an authentic dimsum lunch which was a wonderful experience! Thanks Jacky! Thanks Jacky! Very informative and thorough tour. Well worth it! Our family learned a lot about Hong Kong and covered a lot of areas during the eight hour tour. We had a fabulous day with Jacky in Hong Kong. He was flexible and customized the tour to our interests. We did some wonderful site seeing, ate our way through the city and did lots of shopping too! We loved our dim sum lunch and everything that Jacky taught us about the city. If you are planning a trip to Hong Kong, Jacky is the perfect guide to show you around. We hope to go back to visit him again in the near future! Had lots of fun sampling the different types of food. Highly recommend. TOUR GUIDE RESPONSE: Thank you Alison. Great pleasure to be part of the convention. Let me know should there be any assistance in the future. With limited time in Hong Kong, we were desperate to see as much of this fascinating place as we could. We were not disappointed with our choice of Jacky to introduce us to as much as we humanly possible in the time we had. We have now taken numerous ToursByLocals tours in various countries and we continue to be impressed and happy with our choices. Jacky was no exception. Jacky knew Hong Kong like no one else. He gave us plenties of tips to get around the town. He also showed the best spots for local food fruits. Something you cannot get from online or books! Jacky picked us up at our cruise ship terminal & provided us with a very up close look at Hong Kong. We told him that we wanted to see all of the interesting places that the tourists don't usually see & he really delivered. He even took us to a VERY local restaurant for a very local & delicious lunch. When he delivered us to the airport for our trip home, we didn't want to leave. He is a very knowledgeable & dedicated tour guide I would recommend to anyone wanting to see the real inside of Hong Kong. Very knowledgeable and interesting. Very convenient. He took us to Tao O, a small fishing village built on stilts—fascinating. He also took us to a local watering hole: The Three Lanterns. He introduced us to native sweets that he had enjoyed as a child. Overall, excellent tour! Jacky filled in as our tour guide when Mandy unexpectedly canceled on us a week before our trip. Jacky made the most of our day together, covering a tremendous amount of the city. He also gave us suggestions on other things to do while we were there. We loved that he took a lot of candid photos of our group throughout the day which he later sent to us. Had a fabulous tour!! Highest recommendation!! Our guide was exceptional!!! Excellent! Jacky took time to research our area of interest (WW II sites) and sent us links to review both before and after the trip. Driving in a private vehicle that could get through the small roads in the busy central area of HK meant we saw a lot more (compared to the bigger buses). Experiencing a local dim sum and afternoon tea with a local himself was very enjoyable. Truly a rewarding experience and well worth it! Jacky even captured some great photos of the day which he shared with us. We loved our tour with Jacky. He was very informative and loved that he sent us photos of our day after the tour. Great evening visiting the streets of Kowloon by night. Fun exposure to the locals night markets, street kareoke, Wonderful food and night seen. Jacky had a comfortable, relaxed style and knowledgeable insights about life and living in Hong Kong. This was by far the most enjoyable days sightseeing I have done. Jacky showed our all things we wants to and so much more. His driving was excellent. His communication skill excellent. If we get back to Hong Kong I will be booking another day with him. Jacky was amazing... took us places we had no idea existed. My watch band broke and he found a place to fix it that was open at 10:00pm so I'd be happy. He is so thoughtful with tons of personality. Best guide ever! Jacky was wonderful. We spent about 5 hours seeing the highlights of Hong Kong. Jacky also gave us great tips on how to manage our plans for the next day. Absolutely felt like a "local"! TOUR GUIDE RESPONSE: Thank you so much Courtney for your review. Hope you liked Hong Kong and come back for more. Quick, fun overview of Hong Kong, hitting the Peak and a number of markets on both the Kowloon and Hong Kong side. Jacky was the perfect guide for giving us a local's perspective. Would highly recommend booking this tour for the start of your trip in Hong Kong! TOUR GUIDE RESPONSE: Thank you Sephora for the respond. Was a great morning out. Communication with Jacky was good, met as greed at our hotel and had a fantastic tour. He was flexible on where we went and how long we spent there, and ensured that we had local viewpoint of Macau. Would recommend this tour. TOUR GUIDE RESPONSE: Thank you so much Alan. Fascinating stories from you also. Was such a pleasure meeting you. We had a wonderful tour of the beautiful city of Hong Kong with Jacky. He is very knowledgable with the history of this city and we saw beautiful sites. Jacky is friendly, fluent in English and would recommend this tour. It was perfect for our layover and we hope to visit again! This was a great tour of Hong Kong Island, from Victoria Peak to local suburbs to the fishing village in Aberdeen. I really got to see a lot of the city. Jacky is very knowledgeable about the history of Hong Kong. He even took me to a vegetarian dim sum restaurant, since I don't eat pork or shellfish. It was great! I loved that he was able to give me a taste of Hong Kong's special food even with my dietary restrictions. Jacky is very friendly, and I highly recommend him! We took an evening tour of Kowloon. Jacky was punctual and very friendly and knowledgeable about Hong Kong. His English is excellent! The tour was really interesting and let me see what it is like for locals living in Kowloon. We went to a few of the local markets and night markets and even visited the bird market and flower streets. I got to try some of the local street foods, like egg puff (sort of like a belgian waffle) and egg tart (a custard tart). I had a great time! I highly recommend Jacky!! Jacky is very knowledgeable and passionate about his city. In 4 hours we were able to ride on 5 kinds of transportation, see many of the highlights of Hong Kong, feel a sense of history and the pulse of the city. He communicated with us before and after the tour so that we were able to connect easily before the tour and reach our final destination afterwards. And yes, he is right--the bakeries in Hong Kong are far superior to those in mainland China! Jacky was an excellent guide. He was so thoughtful of what I wanted to see and do, and he worked with my limitations on walking and getting around. He was interesting and very nice. I highly recommend him. And it was great to have him drive me around, etc. A great introduction to Hong Kong walking, using the Star Ferry, taxis, and buses. Jacky gave us great ideas of things to do in Hong Kong during the rest of our stay. We highly recommend Jacky for sight seeing in Macau. Not only will you see the touristy historical sights (St. Paul's Cathedral) but also historical landmarks off the beaten path that not many tourists know about, and interesting local markets hidden down side streets. He's very knowledgeable about the history of Macau and it's casino's. We highly recommend Jacky for sight seeing in Hong Kong and Macau. He's very knowledgeable about history and important landmarks. You will see a lot in a minimal amount of time, as he knows his way around Hong Kong & Macau very well, and can help you navigate transportation on your own. He also took us to a nice Dim Sum restaurant at the end of our tour in Hong Kong, that was very good. We enjoyed most of our "Eat Like a Local" night tour, with the exception of some of the food. We did choose "snacking" rather than a sit down meal, so maybe that's how the local Hong Kong people eat. We enjoyed seeing all the outdoor markets and night life in Kowloon on a Saturday night. Jacky is very knowledgeable about the city sights and showed us the best spots where all the locals gather. Jacky really went out of his way to show me all I wanted to see and more. I got to experience the true vibe and life of Hong Kong. I got to see the shops where the locals shop and taste local food. The whole tour was excellent and was worth every step, cent, and minute. I honestly could not have asked or expected any better. We had a great day with Jacky. We had already seen some things on our own, and he was really flexible in setting a course for the day. We covered a lot of ground, and by the time we parted ways, we felt like pros getting around the city via all the different forms of transportation. He also left us with great ideas for our remaining days in HK. Highly recommend. Excellent overview tour of Hong Kong, hitting most types of transportation, popular sites and neighborhoods. We did the "food" version which included a great meal. Enthusiastic about his city, easy to communicate with. TOURSBYLOCALS RESPONSE: Thank you for your valuable feedback! He was great. Very easy to understand. Unfortunately the weather was awful but he made the most of it. Great tour inspite of the weather. Jacky was fantastic - he delivered exactly what we wanted, which was a more authentic look at Hong Kong. We felt we really got to see how people live, eat, shop, commute, etc., and it was a really great, informative, and interesting day. And Jacky is so funny! We enjoyed the tour thoroughly. TOUR GUIDE RESPONSE: Thank you Mary it was a great day out, it was fun for me also. We saw the authentic Hong Kong, how locals really live, work and shop and local transportation. In the process we saw many sights as well, the peak, longest escalator, midlevels and local markets. Jacky is very high energy and packs a lot into the tour. We had lunch at a great dim sum restaurant at which only locals seem to dine and Jacky explained all the dishes we ate and marked them all on the menu for me to take home. I feel that i got a very good look at hong kong and how locals really live. Jacky's Hong Kong tour was great! With the use of public transportation and lots of walking, Jacky took us to areas in the city we would never have visited on our own. We were able to visit some cool tourist attractions too. Jacky took the tour last minute and with minimal prior input from us and unexpected rain, he was able to put together a tour that was insightful and thorough. I highly recommend Jacky as a tour guide while visiting Hong Kong. Jacky was awesome! He was able to accommodate a private evening tour of Hong Kong for us during a layover at the airport...which a lot of other guides weren't willing to do. We were able to see and do a lot in a short period of time. Jacky is funny, knowledgeable, kind and punctual. I would definitely do another tour with! Jacky was right at the Cruise terminal and he took us under his wing and showed us much of Hong Kong prior to our catching the Rail Express to the Airport. We initially stored our bags after checking the larger bags at the appropriate Airline before proceeding on our tour. We enjoyed Jacky and would highly recommend his service to anyone visiting Hong Kong. He is personable, knowledgeable and professional. We our thankful for his help in seeing Hong Kong and getting to the Airport in a timely manner. TOUR GUIDE RESPONSE: Thank you Doug, it was my great pleasure meeting you and Mary. It was unfortunate about the weather. Hope we'll have a better opportunity on your next occasion. Great guide with proficient English. He know Hong Kong very well. Jacky is a pro. In a few hours we knew pretty much everything we needed or wanted to know about Hong Kong that would help us to make the most of our visit. From the orientation to the transportation to food, culture, neighborhoods, restaurants Jacky was informative, personable and professional. We highly recommend anyone traveling to Hong Kong to take this tour. Jacky is an energetic, knowledgable, and friendly Hong Kong native who made the very best of the time we had in our Hong Kong layover, highly recommended!!! We all had a great time with him, learned a lot about this fascinating City, and ending it with a great Chinese lunch. TOUR GUIDE RESPONSE: Thank you John. It was a great pleasure taking you out all out on the day. I feel very delighted seeing all of you enjoying my introduction. Wish you had a great time here in Asia. Jacky spent an afternoon showing us out of the way parts of Hong Kong, definitely "like the locals". It was fascinating and we were introduced to a number of local food specialties that we would never have known of. His knowledge of the history behind what we saw (and ate) was a great bonus. My husband and I would highly recommend touring with Jacky. TOUR GUIDE RESPONSE: Thank you so much Suki, I had a great time on the day also. Great to hear that you all had a great time also. Thank you for the review. Really friendly, and took lots of pictures for us. Took us to cool local places, and a great restaurant. Felt like a local! Jacky was on time, and he was great! TOUR GUIDE RESPONSE: Thank you Reid.... Had a great time with you guys also. TOUR GUIDE RESPONSE: Thank you Judy for the comments. Yes unfortunately everything was not on its usual status. It is Chinese new year, I'm sure we can all understand. Jacky was punctual and informative. He was kind enough to take and send photos from our tour times after the fact which was great too. But he was often far ahead of us when it came to walking around on the tour. We informed him of a recent injury which made it necessary for my wife to walk a bit more slowly. To assure a reasonable pace we should have stopped him and reminded him of her disability but we did not do so which was our error. We had a great time nonetheless. TOUR GUIDE RESPONSE: Thank you David. It was great time you both also. TOURSBYLOCALS RESPONSE: We brought the issue with Jacky and she got in touch with the traveler to solve the misunderstood regarding the walking. We are sure she will pay more attention next time. Jackie was not very good. I kept getting the feeling he was trying to upsell us and to take him to a dinner we were going to and then to be our tour guide in Macau (the place we were going to next). The person I was traveling with was able to walk fine, but slower than Jackie liked and he would be 50 to 100 paces ahead of us. He insisted on taking some pictures of us with his camera. I had to request several times to get them, and when I did, they were very low quality. TOURSBYLOCALS RESPONSE: We are sorry to hear Jordan´s comments. We brought up the comments above to Jacky and made sure this is considered for future tours. A partial refund was issued. TOUR GUIDE RESPONSE: Thank you Diane! I was a great pleasure and great to hear you and Colin enjoyed also. Jacky went the extra mile to make our trip the best possible. Our first tour with Jacky was on Thursday, however, upon our arrival on Wednesday, Jacky called the hotel to make certain we arrived safely and to see if we had any questions or needed anything. Not only did he reach out to us, he came by the hotel an hour early just to talk and answer any questions we had. Many guides can point out the history or take you to markets, but with Jacky, we felt he really cared and was there to help in anyway. TOUR GUIDE RESPONSE: thank you Charles, I enjoyed being out with you guys also. Jacky provided our group of 4 with an excellent introduction to the city of Shenzhen, our first visit to mainland China. He provided us with a good understanding of the city through both his personal knowledge as well as the itinerary he assembled for us. Logistically day was very well organised and went smoothly. We would recommend Jacky to anyone looking to visit Shenzhen or Hong Kong. Jacky was excelent! He show us the locals part of hong kong, we took the bus we walk everywhere we went to local restautants and stores of very intresting things . Markets that where so intresting . Exactly what we where looking for. It's a must when comming to hong kong. TOUR GUIDE RESPONSE: Thank you Alva, pity that you didn't make it to feel it, but I had great time with the rest of your family. Jacky was very knowledgeable with great English skills. TOUR GUIDE RESPONSE: Thank you Linda. I had a great day also. Jacky should be bottled, what a great introduction to Macau. Jacky was on time and so friendly all the time. When next in Hong Kong we will ask for Jacky's loca; knowledge once again. TOUR GUIDE RESPONSE: Thank you Henrik. I had great time also. Our party of 4 just spent 2 days in Hong Kong with Jacky. We had a fabulous time. Instead of sitting on a tour bus, we traveled via public transportation allowing us to view authentic street markets and notable sights, and taste great food. Jacky speaks perfect English. He is knowledgable and has a great sense of humor. He met us at our cruise ship and delivered us back at the designated times.. Our 2-day tour with Jacky was one of the highlights of our 3-week cruise. The four of us just spent 2 days touring Hong Kong with Jacky W. We had a fabulous experience. Instead of sitting on a tour bus, we traveled via public transportation, allowing us to visit authentic street markets, tour notable sights and eat delicious food. Jacky' s English is perfect. He is knowledgeable and has a good sense of humor. Our 2 days in Hong Kong was one of the highlights of our trip. Jacky did a fantastic job showing off Macau in a way a tour group could not. Taking the time to visit the historical sites as well as a few casinos. Jacky has great knowledge of Macau. He also took photos and later e-mailed them to me. I highly recommend Jacky and the tour. Thanks again Jacky for a great tour and great time. A must tour if you are in Hong Kong, visiting the section of Mongkok during the day is not the same as going by night when the area comes alive with it's markets and street musicians. It looks like the back drop of a Hong Kong movie. Jackie did a fantastic job of showing you the area and finding great points to take photos. Do yourself a favor and take the tour. Thanks again to Jacky for a great tour and great time. Jacky is a great guide! He provided us with some historical background while allowing us to soak up the energy of Hong Kong. We felt like Jacky customized our tour to exactly meet our needs. As a family of four, we highly recommend Jacky!! Jacky W. was the best. He is sassy and of course knowledgeable. He is a cool kat. We recommend him highly. We saw Hong Kong at night and saw the behind the scenes of Hong Kong's community commerce. Excellent tour. Jacky took us around HK by ferry, bus, tram and train to fascinating places. We covered lots of ground, saw great sights, sampled great food at places where the locals eat and learned a lot about the history and culture. Would thoroughly recommend Jacky and tour. TOUR GUIDE RESPONSE: Thank you Debra. It was a great day out for me also, look forward meeting you again. 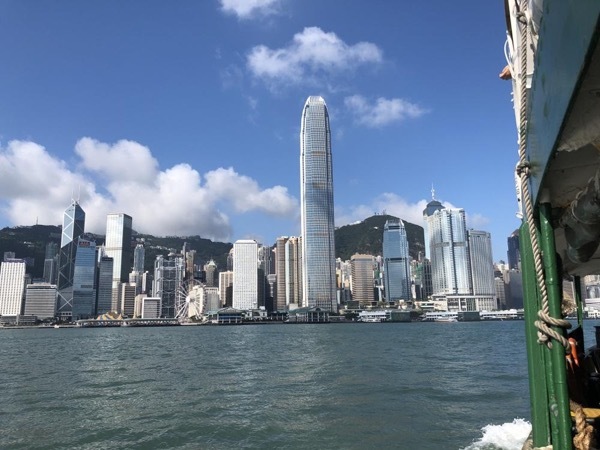 This was an exciting, rewarding and fulfilling tour, Jacky is a very informative and knowledgable guide and thanks to him we were able to explore Hong Kong, Kowloon and Lantau island like a local. Jacky's tour was awesome! It felt like my hip Hong Kong cousin was showing me around town. We saw a lot of local Hong Kong, including several markets, and took the ferry, a mini-bus, and the subway, and grabbed some snacks in a dim sum restaurant where I was the only non-Hong Kong person. Jacky's English is perfect and he's a really nice guy with a love for his city. I highly recommend. TOUR GUIDE RESPONSE: Thanks Brian. I had a great time also on the day..
Couldn't have had a better guide or experience. We finally had to say enough at the end of the day. Jacky was still willing to go more but we had had enough. We got in at least 6 different sites during our 6 to 8 hours with Jacky. Lunch/Dim Sum was something that all four of us will remember. They just kept bring out food. We were a group of two with one day to visit Macau. Jacky expertly guided us through Hong Kong and Macau immigration, then provided us with an interesting introduction to Macau itself. From Portuguese churches to modern casinos, Jacky showed us the major sites of the city. Furthermore when he discerned that our interest lay chiefly with the Portuguese history of Macau, he modified his itinerary to show us more of these sites than originally planned. Overall, it was a great day out. Thank you! We Had a fabulous day with Jacky in Hong Kong! He was very flexible with our schedule. We enjoyed all the wonderful eatery that he took us to. Since he could not be with us the second day, he helped us navigate our second day in Hong Kong. Thank You The Chon family and friend. Jacky did a great job with the tour. He provided me with a great sense of the character of Hong Kong as a city in six hours. We saw some sights, had some great cuisine that I would not have had access to otherwise, and general experienced many aspects of the city that I would never have had a chance to do on my own. He's also great company. I highly recommend him if you want to see Hong Kong. We had already seen the normal highlights of Hong Kong, so Jackie took us to a great restaurant in the iCenter where we had a delicious lunch. We then went to the old center of Kowloon and walked around the area. Then he took us on a trolley ride down Nathan Lane. We then took a subway to the Chi Lin Nunnery at Diamond Hill. When we arrived it began to pour rain, so we did not get to walk around the beautiful gardens. This place was spectacular . Jackie was the perfect guide. We had a wonderful time . TOUR GUIDE RESPONSE: Had a great time with you all also gene. TOUR GUIDE RESPONSE: Thank you for your comments Charles. It was a pleasure to be on a day out with you, it was very enjoyable for me also. Jacky was well versed in the history of Macau. Saw all the old sites plus the modern Macau. Ate with the locals and felt like a local. A must day of sightseeing if you have an extra day while in Hong Kong. Bus, ferry, train, and taxi were all used in our day with Jacky. Saw the key sites, the local areas, and did not pass across one tour bus in our travels. Lunch with the locals at a dumpling restaurant was terrific. Highly recommend Jacky if you have time in Hong Kong.